Of the sites suggested by scholars for the location of the crucifixion of Christ, Scriptural evidence points to a steep slope on the Mount of Olives east of the Temple. It is located outside of the city near a first century road. The slope was unpopulated due to Temple activities in the area. This site fits the truth laid out in God's Word pertaining to the crucifixion. Golgotha - a place of registry where heads were counted. Romans often crucified their condemned men at the place of their crime or at the place of their arrest. 1. Jesus Christ suffered without [outside] the gate of the city of Jerusalem. Hebrews 13:10:12 We have an altar, whereof they have no right to eat which serve the tabernacle. For the bodies of those beasts, whose blood is brought into the sanctuary by the high priest for sin, are burned without the camp. Wherefore Jesus also, that he might sanctify the people with his own blood, suffered without the gate. There was an area for burning the bodies of the sacrifices outside of the city gate. This location is referred to in the Old Testament as a place "without [outside of] the camp" of Israel. After the Temple was built , this place for burning the bodies of the sacrifices had a specific location outside of the city. According to the Mishnah, a second-century Judean commentary, a bridge had been built over the Kidron Valley from the Temple area eastward to the Mount of Olives leading to this location for burning the bodies. "They made a causeway from the Temple Mount to the Mount of Olives, an arched way built over an arched way, with an arch directly above each pier [of the arch below], for fear of any grave in the depths below. By it the priest that was to burn the Heifer, and the Heifer, and all that aided him went forth to the Mount of Olives." - Herbert Danby, trans., The Mishnah (Oxford University Press, 1933), p.700. 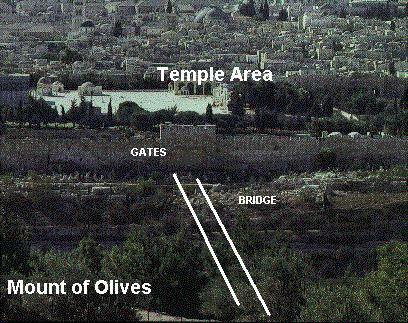 The bridge led from the east Temple gate to a place near the summit of the Mount of Olives. The priest could pass over this bridge uncontaminated by the graves below in order to burn the bodies of the animals outside the city. 2. Jesus was crucified near the Temple. According to John 19:20, "the place where Jesus was crucified was nigh to the city." This is a mistranslation. The word place in the Greek is associated with "the city," so that this verse should be translated, "Jesus was crucified near the place of the city." "The Place of the city" was the Temple, which is also called "the place." "The text reads - take away the place and the nation. By the place - the Pharisees meant the Temple. The area of burning on the Mount of Olives east of the city was considered part of "the place." This location was outside the city and yet near (and part of) the Temple proper. 3. "Golgotha" refers to a place of registry where heads were counted and not a place that looks like a skull as the King James version implies. Ezekiel 43:21 - Thou shalt take the bullock also of the sin offering and he shall burn it in the appointed place of the house, without the sanctuary. The words "appointed place" in the Hebrew is the word "miphqad." Miphqad comes from the verb paqad which means to number. The gate of the city that led to the "appointed place" was called the Miphkad Gate. The Miphkad Gate (referred to in Nehemiah 3:31) was located on the east wall just north of the east gate leading to the Temple. The Miphkad Gate opened onto the road leading up the Mount of Olives just north of the place where the bodies were burned. This road led to the Miphkad, or "appointed place," where people registered for the Temple tax. Each person [head count] was taxed at this location. The word "Golgotha," used in the Gospels to describe the place of the crucifixion, is an Aramaic word which suggests this area of registry known as Miphkad. The related Hebrew word bears the same meaning. It is gulgoleth, which means "skull, head, or poll." It is a head count. In the time of Jesus Christ, this place of numbering, or registration, for the Temple tax was called Golgotha. This was the Miphkad area on the Mount of Olives east of the Temple and near the place outside the city where the bodies of sacrifices were burned. 4. Romans often crucified their condemned men at the place of their crime or at the place of their arrest. Luke 23:2: And they began to accuse him, saying, We found this fellow perverting the nation, and forbidding to give tribute to Caesar, saying that he himself is Christ a King. The crime that Jesus was accused of was that he was proclaimed to be king. This "crime" took place on the Mount of Olives. Jesus Christ was proclaimed king [HIS CRIME] on the Mount of Olives and later arrested at the garden of Gethsemane of the Mount of Olives. The Mount of Olives was the place of his arrest. Golgotha (the place of the head count for the Temple tax) was on the Mount of Olives near the place where the bodies of sacrificed Temple animals were burned. This steep slope on the Mount of Olives east of the Temple was outside the east gate of the city of Jerusalem and fits all Scriptural evidence for the location of the crucifixion. It is also interesting to note that Jesus Christ ascended from the Mount of Olives and "this same Jesus, which is taken up from you into heaven, shall so come in like manner as ye have seen him go into heaven."